By most accounts, when Enos “Country” Slaughter joined the Yankees in 1954, many of his new Yankee teammates weren’t too fond of him. That group included and was probably led by the temperamental Billy Martin, who thought Slaughter ‘s habit of running hard to first on every hit ball and even after bases on balls, was an attempt to show up his teammates. 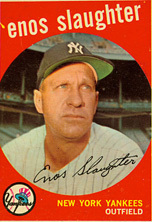 Martin considered Slaughter and for that matter most teammates who had not come up through the Yankee organization, as outsiders who could not be trusted on the field or in the clubhouse. Fortunately for Slaughter, Casey Stengel did not share that sentiment, probably because he was an old National Leaguer himself. Slaughter explained the real reason he hustled every second while on the field in his autobiography. He was playing on a Cardinal farm team in Columbus, GA in 1932, hitting in the low .200’s and thinking he was going to be released any minute when in between innings during a game, he walked backed to the dugout from his right field position. Burt Shotten happened to be his Manager at the time and when Slaughter finally got to the dugout, Shotten told him if he was too tired to run back to the bench that maybe he was too tired to play in the game. Slaughter said that not-too-subtle hint from Shotten forever changed the way he approached the game. He vowed that he would never ever loaf on a baseball field again and he kept that promise for the next 27 years. The saddest day of his life was August 11, 1954, the day the Cardinals traded him to the Yankees. He actually burst into tears after hearing the news but not because he had any particular animosity toward the Bronx Bombers. Slaughter absolutely loved playing in St. Louis and never dreamed getting traded was even a remote possibility. As hard as it was for him to do so, Slaughter brought all of his experience and enthusiasm for the game with him to New York. From 1954 until he was traded to Kansas City in 1955 and then again after he was reacquired by New York a season later until 1959, Casey used the aging veteran frequently as both a pinch hitter and outfield substitute. He also treated Slaughter as his bench coach. The two veterans would often sit next to each other in the dugout, constantly discussing strategy and possible moves. Slaughter contributed on the field as well. He was a star in the 1956 World Series, hitting .350 as the Yankees beat Brooklyn. His best regular season in pinstripes was 1958, when he hit .304 in 160 plate appearances. Enos retired after the 1959 season, at the ripe age of 43 and was inducted into the Hall of Fame, 26-years later. He passed away in 2002 at the age of 85.